Telecommunications Engineer (Sound and Image) and Multidisciplinary Artist. After directing a documentary in Hollywood about John Frusciante's life (ex Red Hot Chili Peppers) he began to work making videos for music bands like Chambao ('lo mejor pa tí',2013). 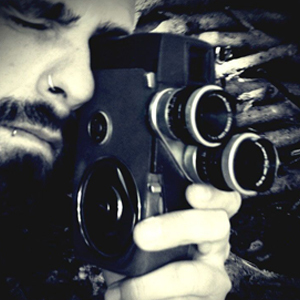 He has also directed Tv series like 'Fausto' (2011) in super 16mm or Films like 'N/949' (2013). His Videoart have been in museums like CAC Málaga or ERARTA Saint Petersburg ('morphogénesis',2014), winning prices in International Experimental Cinema Festivals like PROTESTA 2016 (ʻpreferentesʼ, 2016, First Prize) or BIDEODROMO 2015 ('broken mirrors', 2014) or in Important and independent Cinema Festivals like Festival de Cine de Málaga 2015, THIRD CULTURE Film Fest Hong Kong 2016, Feminist and Queer Int. Film Fest Bucharest 2015, Muestra de Videoarte y Video Experimental Intermediaciones Medellín 2015, EXILE Film Festival Malmö 2016, etc.